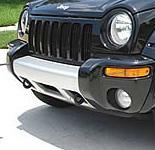 Silver Front Bumper Accent found on the 2002-2004 KJ Liberty Renegade models. Will only fit on Renegade Model Libertys. I have been looking all over for this part and finally on Just for Jeeps I found it. Shipping was fast and the part arrived well packaged. Only suggestion would be a how to install paper, like I received with my license plate holder.